We argue that student research skills in mathematics should be honed throughout the curriculum just as such skills are built over time in the natural and physical sciences. Examples used in the mathematics program at St. Olaf College are given. This student submission comes from my former student Chelsea Hancock. Her topic, from Precalculus: synthetic division. The method of synthetic division is an alternative version of long division concerning polynomials. Synthetic division uses the basic mathematical skills of addition, subtraction, multiplication, and negative signs. They must also understand the definitions of polynomial, coefficient, and remainder. A polynomial is an expression with multiple terms, poly meaning “many” and nomial meaning “term.” A coefficient is a number used to multiply a variable. The remainder is the amount left over after division. Synthetic division involves multiplying, then adding or subtracting the coefficients of two polynomials. On some occasions, there will be a remainder after dividing the polynomials. Mathematicians are lazy. That is a fact of life. One mathematician understood this, so in 1809 he created a cleaner, faster, and much simpler method for division. His name was Paolo Ruffini. In order to more efficiently divide polynomials, Ruffini invented the Ruffini’s Rule, known more commonly as synthetic division in today’s society. In 1783, he entered the University of Modena and he studied mathematics, medicine, philosophy and literature. Then, in 1798 he began teaching mathematics at the University of Modena. He was required to swear an oath of allegiance to the republic, but due to religious purposes, refused to do so. This resulted in the loss of his professorship and was prevented from teaching. There are several videos on the Internet involving synthetic division, but there are two in particular that I personally think are excellent demonstrations of both the method itself and why it works. I have labeled these clips Video 1 and Video 2. Video 1 is a demonstration of the method in action, using a specific example involving numbers, walking the viewers through the process through the whole video. Video 2 explains why using synthetic division instead of using long division is the more efficient and less complicated method for dividing polynomials. The clip uses the same example used in Video 1, but this time the polynomials are divided using long division, walking the viewers through the process the entire time. As the narrator moves through the process, he makes connections between the synthetic division method and the long division method and draws conclusions between the two. By the end of the video, it is evident which is the cleanest method to use when concerning the division of polynomials. These videos not only give great tutorials on both methods of division, but allows the viewers to see the benefits and uses of synthetic division when it is possible to use it. In the previous two posts, we considered the use of base- arithmetic so that a calculator can solve addition and multiplication problems that it ordinarily could not handle. Today, we turn to division. Let’s now consider the decimal representation of . There’s no obvious repeating pattern. But we know that, since 17 has neither 2 nor 5 as a factor, that there has to be a repeating decimal pattern. When I ask this question to my students, I can see their stomachs churning a slow dance of death. They figure that the calculator didn’t give the answer, and so they have to settle for long division by hand. However, using the ideas presented below, we can perform the long division extracting multiple digits at once. 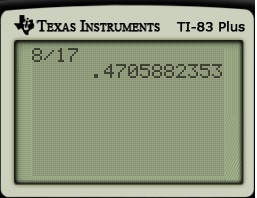 Through clever use of the calculator, we can quickly obtain the full decimal representation even though the calculator can only give ten digits at a time. Let’s now return to where this series began… the decimal representation of using long division. As shown below, the repeating block has length , which can be found in a few minutes with enough patience. By the end of this post, we’ll consider a modification of ordinary long division that facilitates the computation of really long repeating blocks. Because we arrived at a repeated remainder, we know that we have found the repeating block. So we can conclude that . Given two integers and , with , there exist unique integers and such that and $0 \le r < |b|$, where denotes the absolute value of . The number is typically called the quotient, while the number is called the remainder. So, with these two alternate steps, we arrive at a remainder of and have found the length of the repeating block. The big catch is that, if or and , the appropriate values of and have to be found. This can be facilitated with a calculator. The integer part of and are the two quotients needed above, and subtraction is used to find the remainders (which must be less than , of course). At first blush, it seems silly to use a calculator to find these values of and when a calculator could have been used to just find the decimal representation of in the first place. However, the advantage of this method becomes clear when we consider fractions who repeating blocks are longer than 10 digits. Let’s now return to the question posed at the top of this post: finding the decimal representation of . As noted in Part 6 of this series, the length of the repeating block must be a factor of , where is the Euler toitent function, or the number of integers less than that are relatively prime with . Since is prime, we clearly see that . So we can conclude that the length of the repeating block is a factor of , or either , , , , or . We clearly see from the calculator that the repeating block doesn’t have a length less than or equal to . By process of elimination, the repeating block must have a length of digits. Now we perform the division algorithm to obtain these digits, as before. This can be done in two steps by multiplying by . In other words, through clever use of the calculator, the full decimal representation can be quickly found even if the calculator itself returns only ten digits at a time… and had rounded the final of the repeating block up to . Uh oh… the calculator doesn’t give the complete answer. It does return the first nine significant digits, but it doesn’t return all 16 digits. Indeed, we can’t be sure that the final 5 in the answer is correct because of rounding. So now what we do (other than buy a more expensive calculator)? In yesterday’s post, I posed a similar problem involving addition. Adding two big numbers by hand is no big deal. However, multiplying two big numbers, one digit at time, would be tedious! Now we proceed as if each block of five digits was a single digit. We begin with the last block of digits on the second row, which is 48974. First, we multiply 6797 and 48974 using a calculator. Because most modern scientific calculators have a 10-digit display, we can be assured that the complete answer will be shown. (This is why I chose to divide the numbers using block of five digits and not six or more.) The last five digits in the answer are written down; the more significant digits are carried. Next, we multiply 2236 and 48974 and then add the number that was carried. We then repeat using 2449, the next (and final) block of digits on the second row. First, we multiply 6797 and 2449 using a calculator. The last five digits in the answer are written down; the more significant digits are carried. Next, we multiply 2236 and 2449 and then add the number that was carried. Finally, it remains to add these two partial products to obtain the final product. For this problem, this can be accomplished with only a single addition: the block of digits 76278 simply carry down to the final answer, and so we can start by adding the second and third blocks of digits. As this sum is less than , there is no digit to carry, and so the leading 54 also carries down to the final answer. The above technique is logically equivalent to using base 100,000 as opposed to the customary use of base 10 arithmetic. So while multiplying two numbers in the billions still takes some time, judiciously using a calculator makes this exercise go a lot quicker than the ordinary grade-school method of multiplying one digit at a time. Uh oh… the calculator doesn’t give the complete answer. It does return the first nine significant digits, but it doesn’t return all 16 digits. Indeed, we can’t be sure that the final 7 in the answer is correct because of rounding. This is logically equivalent to using base 1000 to add these two numbers (as opposed to base 10) and is certainly a lot faster than using only one digit at a time. Of course, it’d go even faster if we use up to nine digits a time (which is equivalent to using base one billion). I encourage teachers of statistics to read the entire article. Assume that Venus and Earth both have circular orbits around the sun with radii 68 million miles and 93 million miles, respectively. Just after sunrise, an astronomer sees Venus on the horizon and measures the angle between Venus and the sun to be 20 degrees. Find the possible distances from Venus to Earth at that moment. 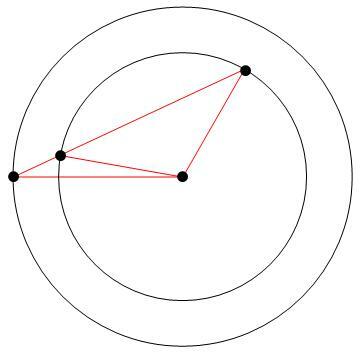 I won’t go through the solution of the problem… it’s a fairly straightforward application of SSA techniques. But I’ve always had a soft spot for this problem… probably because I have a soft spot for astronomy and the picture of the planets in their orbits makes perfectly clear why the information can narrow down the answer to two possible solutions, but more information is needed in order to figure out which one is actually correct. How high can you count on two hands? How high can you count on two hands? The answer is 1023, if you use binary. I made the following video to demonstrate this to my students. True story: This is a trick that I came up with when I was 10 years old. As is common in classrooms, my teacher had had enough disruptions in class, and told us students to put our heads on our desks in silence for 15 or 20 minutes as punishment. Naturally, I was trying to think of something to do to pass the time, and I somehow came up with the idea that I could keep myself entertained by counting in binary using my fingers. When I was a kid, I could count to 1023 in about 5 minutes. But I was a lot more dextrous then, and so it takes me about 6 or 7 minutes today.